The Taj Mahal is an ivory-white marble mausoleum located on the south bank of the Yamuna River in the Indian city of Agra. It encompasses nearly 17 hectares of land. In 1631, Mughal Emperor Shah Jahan got this monument constructed in the memory of his beloved wife, a Persian princess who died after giving birth to their 14th child. This is why Taj Mahal is considered as the epitome of love and a monument of immeasurable beauty. It is the love behind this outstanding monument that has given it a life. 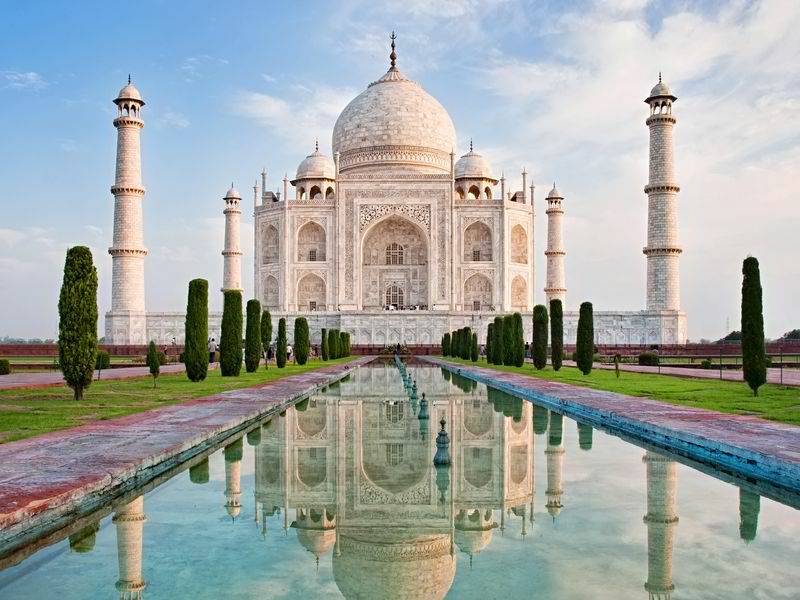 The name “Taj Mahal” was derived from the name of his wife, Mumtaz Mahal and means “crown palace“. Taj Mahal has a central dome which reached a height of 240 feet and is surrounded by four slender towers which stood at the corners. In addition, the mausoleum is considered to be the greatest architectural achievement in the whole range of Indo-Islamic architecture. The Taj Mahal is also regarded by many as the best example of Mughal architecture and a symbol of India’s rich history. The Taj Mahal is a perfect symmetrical planned building with the octagonal tomb chamber in the center. 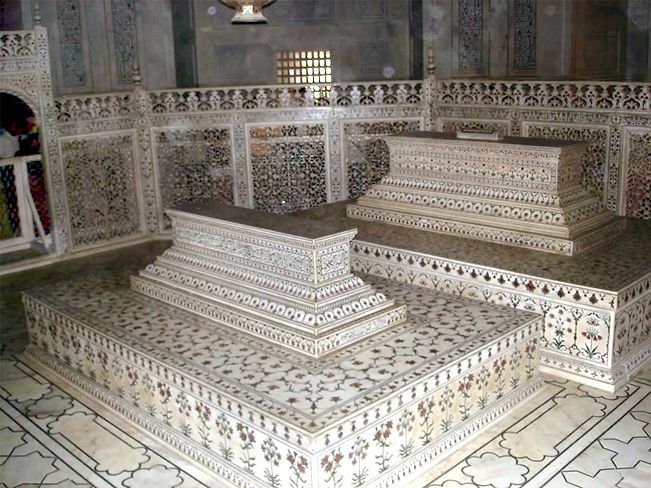 The Mughal tomb is the central focus of the entire complex of the Taj Mahal. It is encompassed by the portal halls and the four corner rooms. The tomb is a large, white marble structure standing on a square plinth and consists of a symmetrical building with an arch-shaped doorway topped by a large dome and finial. The plinth and tomb took roughly 12 years to complete. The tomb is placed at one end of the quadripartite garden rather than in the exact center. Another impressive feature of the Taj Mahal is the main gate. The gate stands majestically in the center of the southern wall of the forecourt. It is flanked on the north front by double arcade galleries. The garden in front of the galleries is subdivided into four quarters by two main walk-ways. Each quarter in turn subdivided by the narrower cross-axial walkways, on the Timurid-Persian scheme of the walled-in garden. The enclosure walls on the east and west have a pavilion at the center. The Taj Mahal is one of the Seven Wonders of the World and was designated as a UNESCO World Heritage Site in 1983 for being “the jewel of Muslim art in India and one of the universally admired masterpieces of the world’s heritage”. The Taj Mahal attracts about 8 million visitors a year and has gained a place amongst the most sought-after tours in the world. What the tourists admire about the Taj Mahal is not just the purity of the white marble, precious gemstones, exquisite ornamentation and the picturesque location but also the immense love of the emperor for his favorite wife which was the reason behind its construction. Although the Taj Mahal suffered from neglect and disrepair in the two centuries after Shah Jahan’s death, it was restored in the 19th century and has been preserved since then. It was the British viceroy of India, Lord Curzon, who ordered a major restoration of the mausoleum complex as part of a colonial effort to preserve India’s artistic and cultural heritage. To this day, the Taj Mahal remains as a masterpiece of architectural style in conception, treatment, and execution and has unique aesthetic qualities in balance, symmetry and harmonious blending of various elements. My name is Jacky and I live in beautiful Toronto, Canada. I love to travel! I have been to 20 countries so far, mostly within North America, Europe, and more recently Asia. I enjoy sharing my travel experiences and advice with others that share the passion. To read more about me visit my "About Me" page!